My friends say they never get tired of my gyoza. 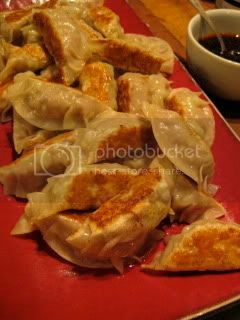 And, guess what, my kurobuta pork gyoza pairs wonderfully with Barbaresco. 2007 Ca' du Rabaja, Barbaresco "Rabaja", which (Rabaja) is considered to be the best cru of Barbaresco. The wine had a complex flavors of spices and dark berries with a hint of sweet ripeness.